This turned out to be a long day with me making just about every mistake possible. I started with the motor mounts. These are similar to the 944 mounts, only bigger. They fit together with a mounting bracket and a seat which you can see I had cleaned up and painted. They also fit between a pair of heat shields, those turned out to be the point of some aggravation. I also have gone around the engine bay looking at everything that may turn into a problem that would require the engine to come back out. I enjoy tinkering but getting this big engine in and out of this small space is a pain. I also have several things installed on the engine, trying to minimize the work that has to be done after the engine is in. I would like to do more on the electrical harnesses and maybe do some light detailing of the intake tubes but those are things that can wait. So, for now I think we're ready to get the engine back in and move ahead a little on this project. I get the car up on ramps and wheel the engine over for the drop. Right away I see the fan has to come back off to get room, so I quick loosen up the belts and get that out of the way. 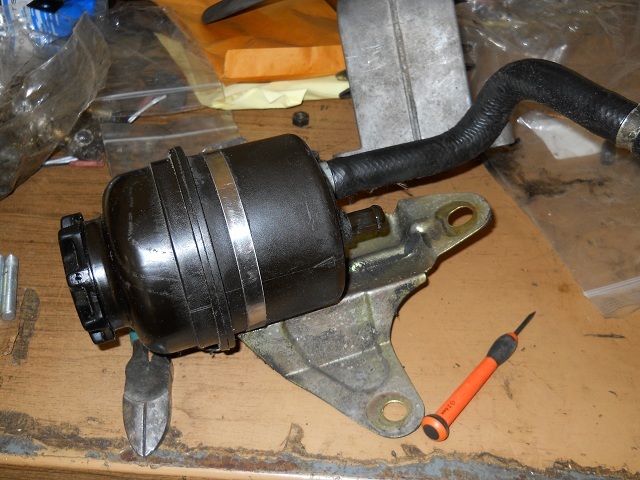 Next, the power steering reservoir is in the way of the alternator. Since the reservoir is easier to pull (and I have a new one), it comes out next. Next comes the AC compressor, that I still have hanging on a wire is in the way. And, even with the compressor lowered to the floor, the upper end of the compressor's line is in the way of the air pump. So, the air pump comes off next. Finally, I'm starting to get close to getting the engine down onto the mounts. The next problem is that the motor mount heat shields keep getting hung up in the engine. If I had had a helper on hand, he could have probably held the shields clear for the drop but except for Helder-dog George, I'm in this mess by myself. So, the heat shields come off. Even with them removed, I have to make countless adjustments to the leveler to get the engine in close to alignment with the mounts. The leveler by itself is really not enough as the engine tends to hang lower on the driver's side. In the end, I get a strap to help support that side (not shown. In the pic below, you can see how the edge of the pan is hanging on the edge of the mount. So, I dig out the most important tool of the day - a hefty prybar. 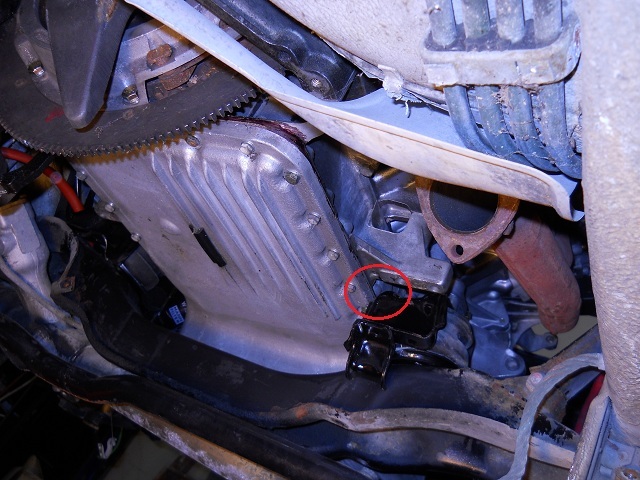 Now about those motor mounts... weak or even collapsed motor mounts are somewhat common in 928s. 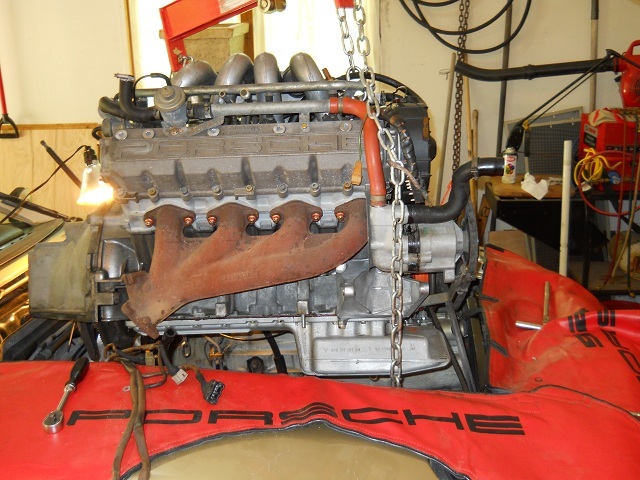 When I pulled this engine apart I wasn't certain but I thought the engine seemed to be sitting about right as far as height goes. 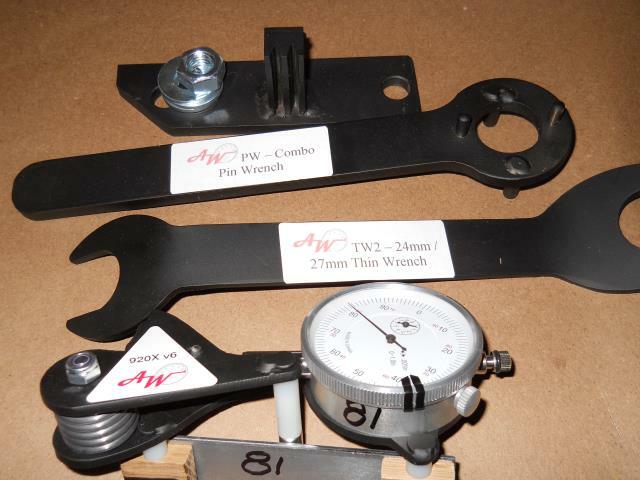 I assumed there would be a measurement of the mounts that would be specified in the WSM (this is how it is done on the 944) and I would make the final assessment of the mounts with a measurement. 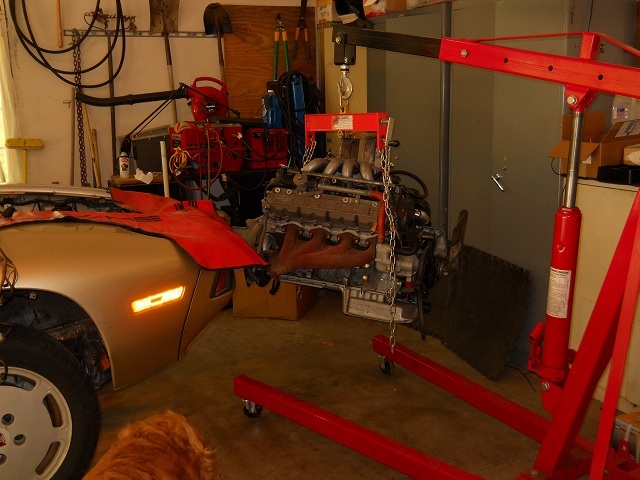 But, as it turns out, there is no such measurement for the 928. So, I have to fall back to, putting the engine in and letting it sit for a few days before again assessing if the mounts are collapsed or not. Side note: OEM motor mounts are expensive, there are some alternatives but if the originals are good, then I definitely want to stay with them. At the end of day one, I have nearly a finger's width between the cross-member and the pan. I'm thinking that is good but we'll give it time to be sure. 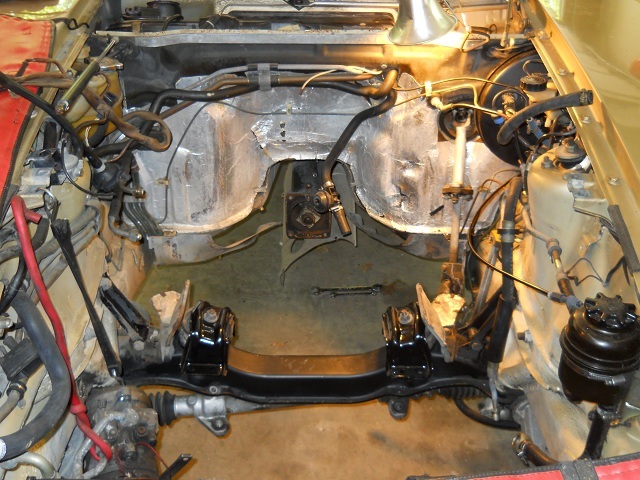 Even if I have to go back in to do the motor mounts, its not a huge deal (lower the steering rack, disconnect the motor mounts and lift the engine about 2 inches). There are a lot of little things that have to done from here. First up is getting those pesky motor mount heat shields back in place. Doing this is one of those Porsche things where you can either see the mounting holes or you can touch them, but you can't do both. So there's a fair amount of the Hellen Keller approach to assembly. This is not quite as bad as it sounds, especially if the engine is no longer a giant grease-ball. With the mounts in and secure, I move to the clutch housing. 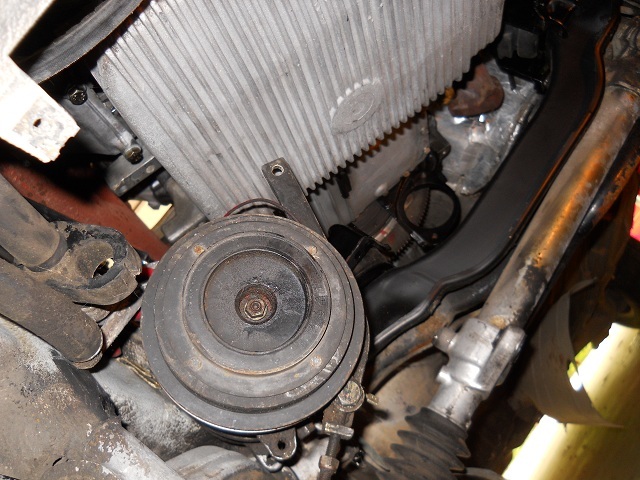 Here, I just need to get the big bolts in place and join the torque tube to the splined clutch shaft. 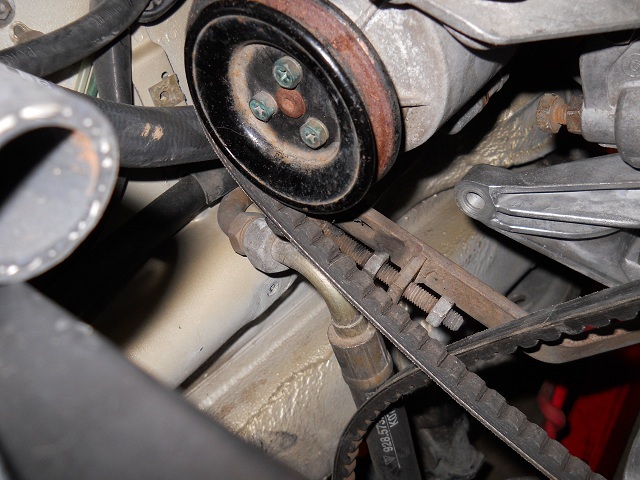 That goes without a hitch and I move to the clutch slave cylinder. The mounting is pretty straight forward but the hydraulic line has some mounting hardware that need some study to get right. I wish now I had taken better pictures of this area before removing everything. Securing the motor mounts to engine bolts is next and that pry bar is kept close by to get things lined up. I got busy with a few other projects so a few days away from this puppy. Back today working on details. Little things like getting the wiring bundles back into place, getting the accessories back connected and belts tightened and dealing with some clutch bleeding issues. Also beginning the exhaust install. I am inching forward with only the fan and radiator to go.